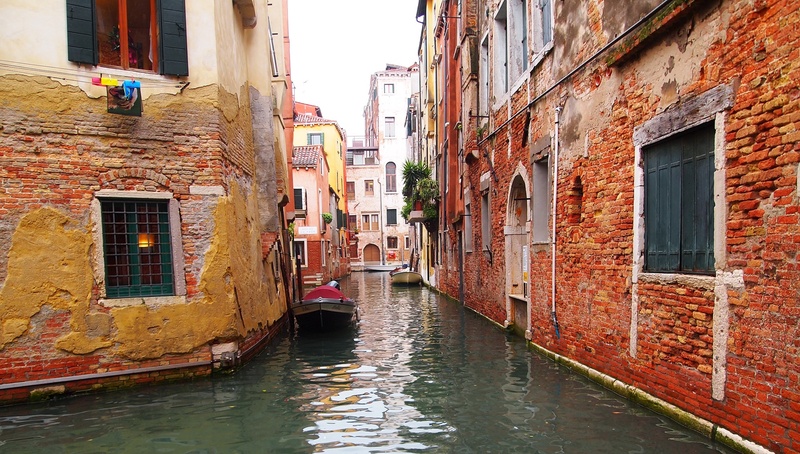 Before I even knew I’d be studying in Florence, I dreamed of going to Venice. 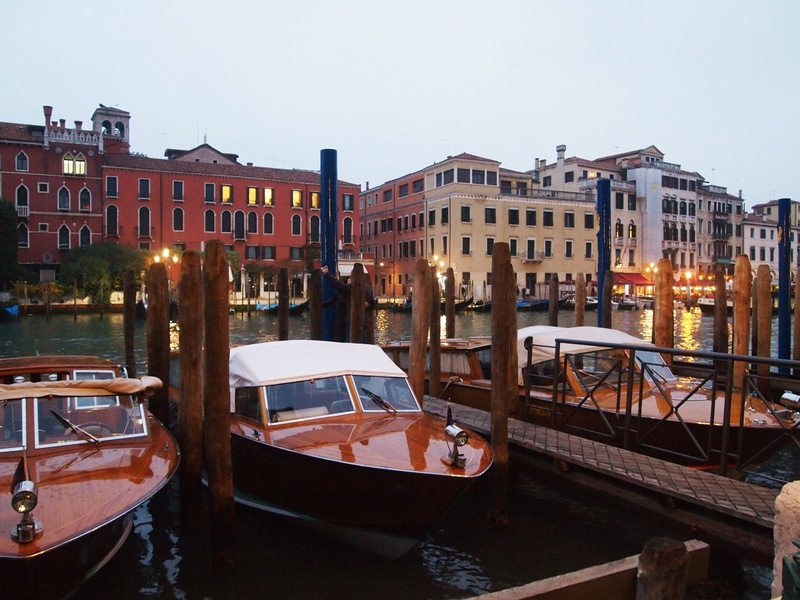 The sparkling city on the water, full of extravagant elegance at every turn, was like a far-off fairy tale to me. It was something out of the pages of an ancient romantic story, its pages telling of mysterious and festive masquerade balls and artists still practicing their intricate crafts. 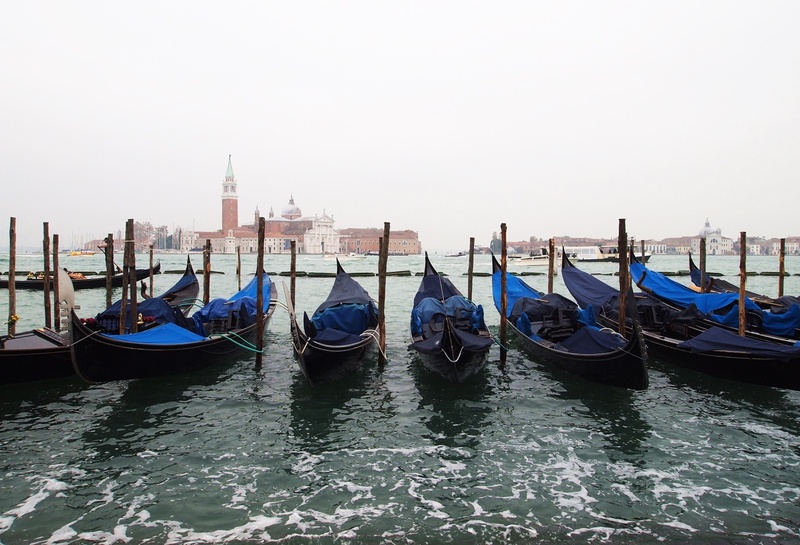 Gondolas lined up along the water, ready to take passengers through Venice’s famed canals. 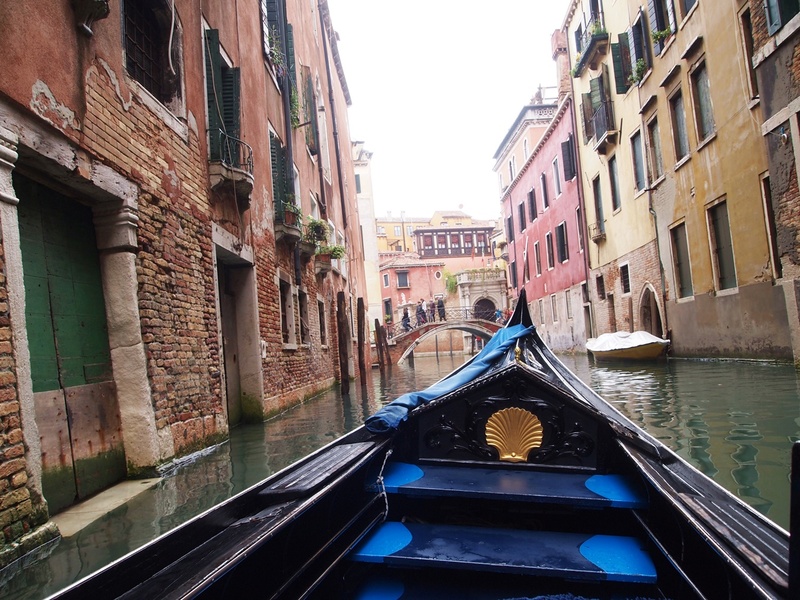 So, when I first arrived in Italy, I blocked out a weekend in November (best to go in the off-season – Venice can get very crowded around vacation times) and started thinking of things I wanted to do there. Soon enough, that weekend was upon me. A few friends and I took the train from Florence on Friday morning, enjoying the scenery of Italy’s Emilia-Romagna and Veneto regions pass us by. We’d have the next two days to enjoy in the city, before setting off for Verona on Sunday. 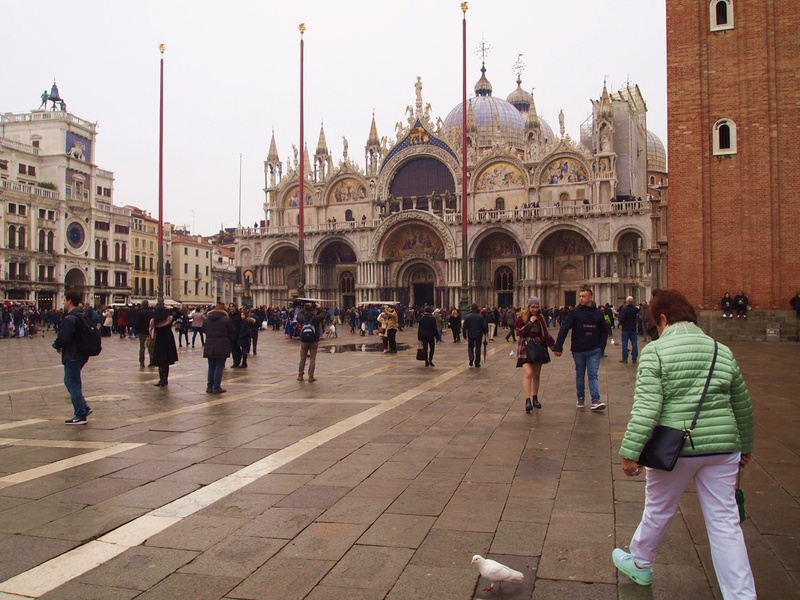 When I first stepped out of the Santa Lucia train station, I was awestruck. 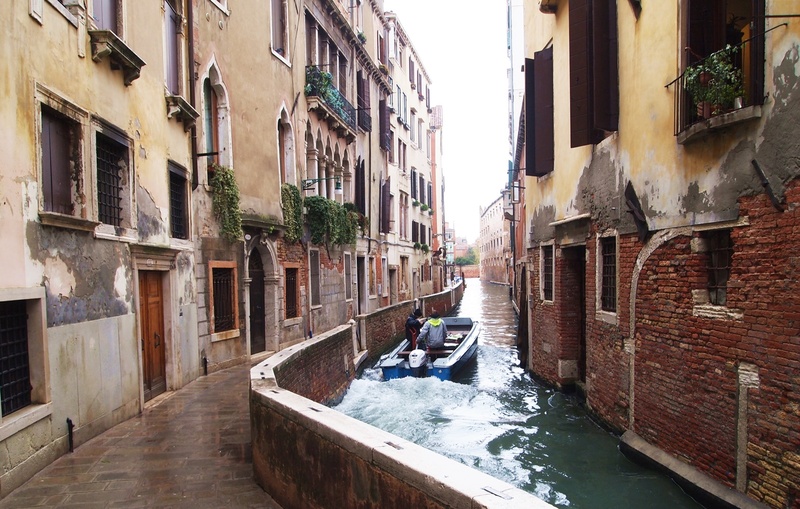 I didn’t have to walk around to find the famous canals of Venice – they were right there. 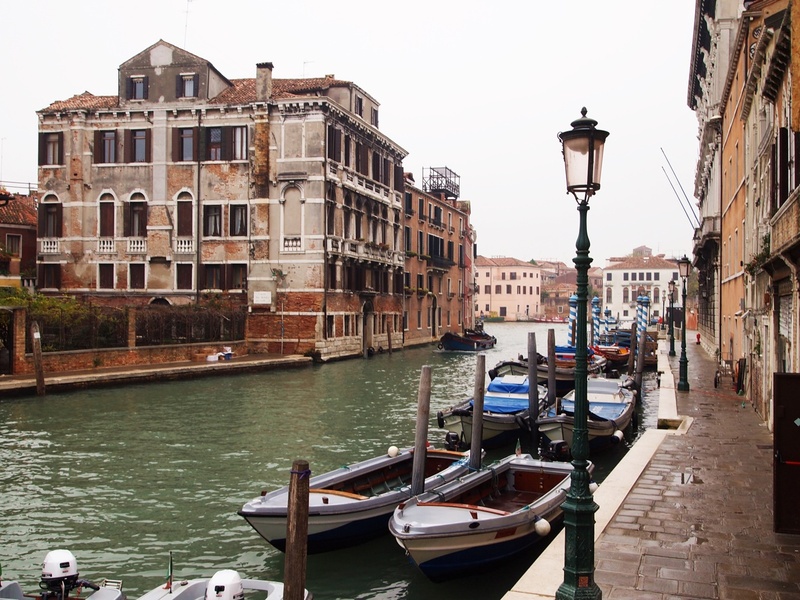 Just under a hundred yards or so from the station was the main one – the Grand Canal. 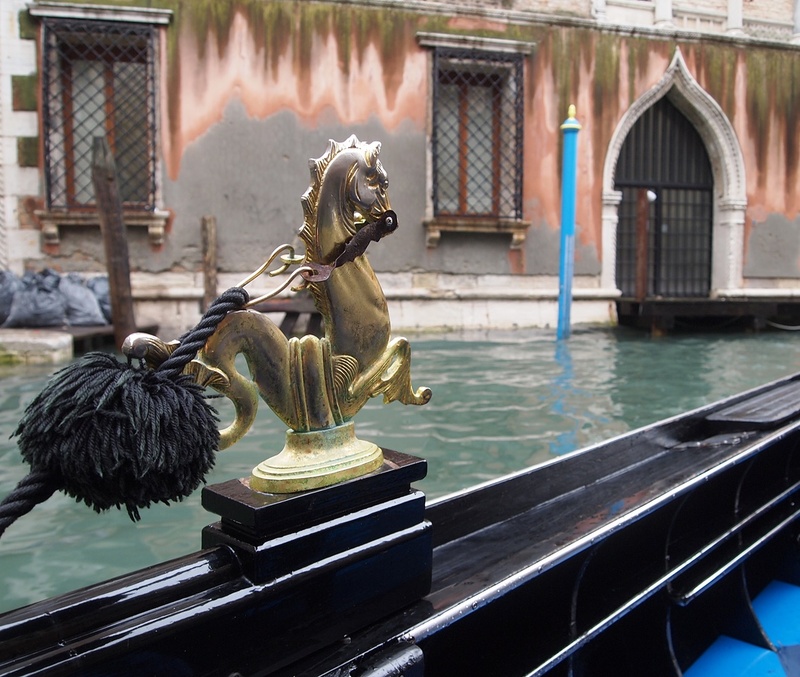 As we walked on, we saw shop after shop selling artwork by local artists who’d inherited their crafts from generations of Venetian heritage. The stone streets were exactly what I’d dreamed of, and every so often, we’d cross a little footbridge to continue our wandering. That was my main goal for the weekend – to wander. 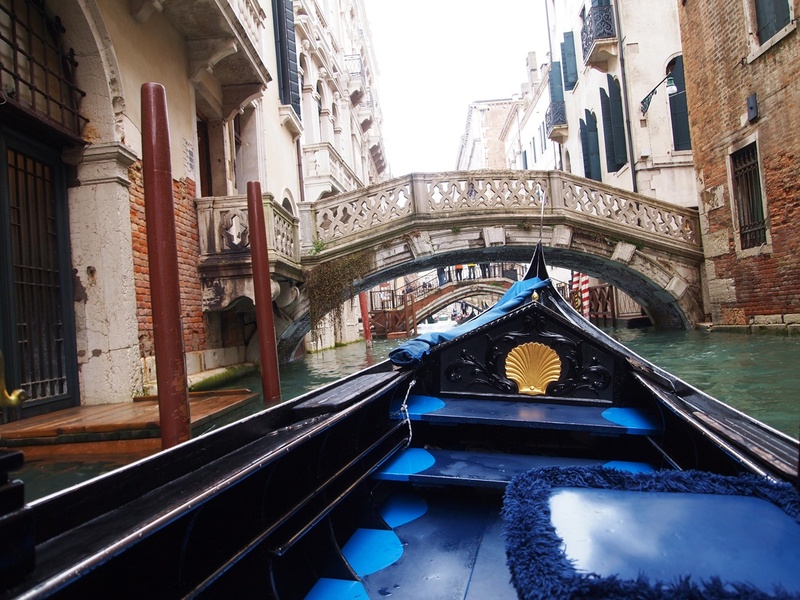 I’d heard that if I were to get lost in any city, Venice was the one to do it in. And the one it was most likely to happen in. The tiny streets were really designed only for foot traffic, and at times it felt like walking through a never-ending maze, in which re-tracing one’s steps is all but impossible. And it was wonderful. 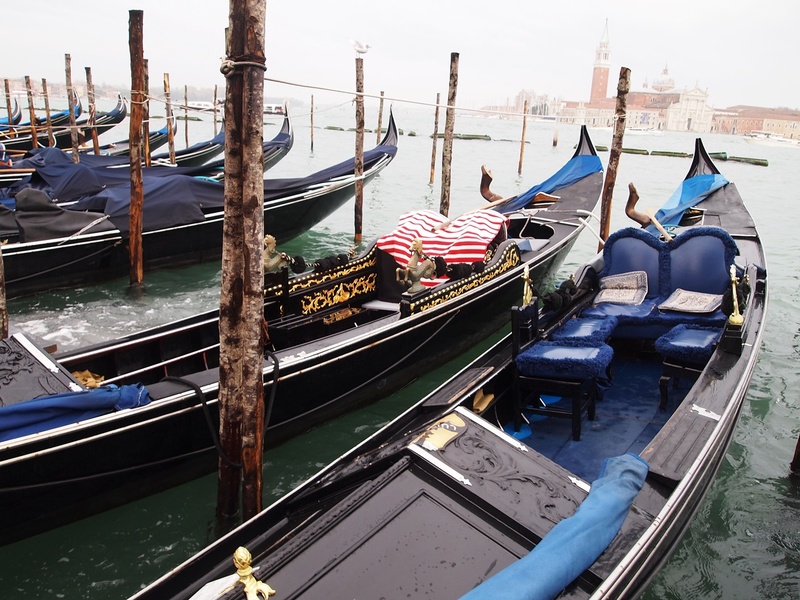 Boat and your own two feet are the most efficient modes of transportation in Venice. 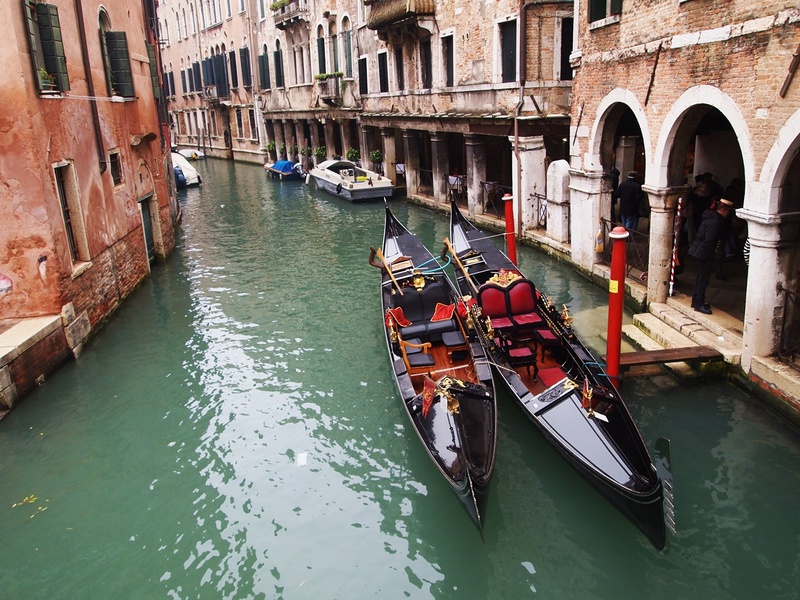 Two gondolas parked beside a building, waiting to take passengers on their own fairy tale adventures. 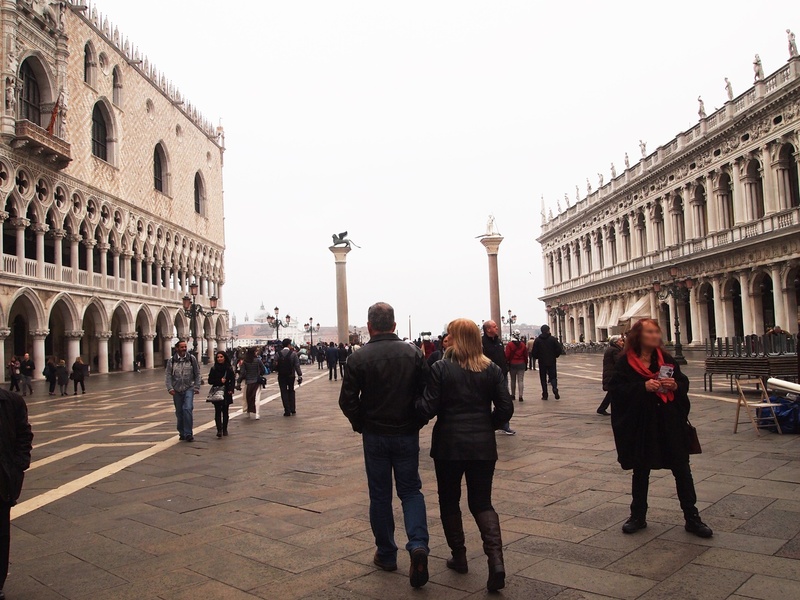 Entering Piazza San Marco – the largest and most famous piazza in the city, and the site of St. Mark’s Basilica. 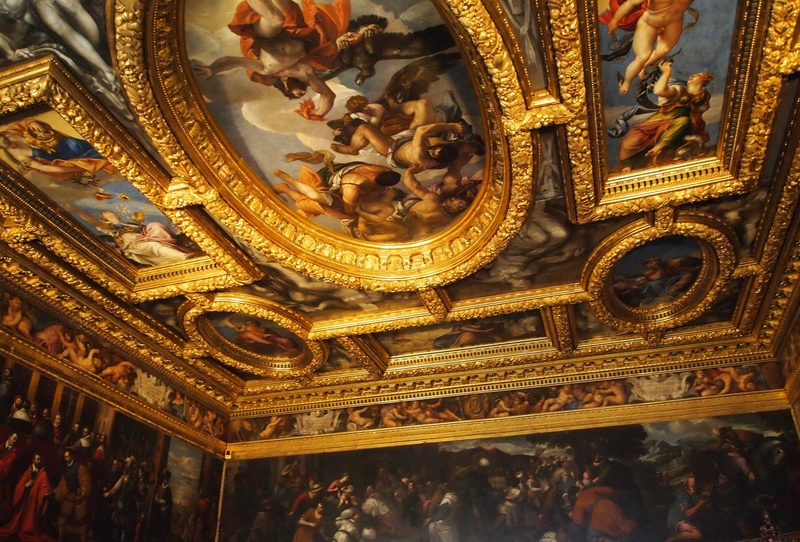 The ornate exterior is only a shadow of the opulence of the ornate interior. Golden mosaics make the entire structure sparkle. 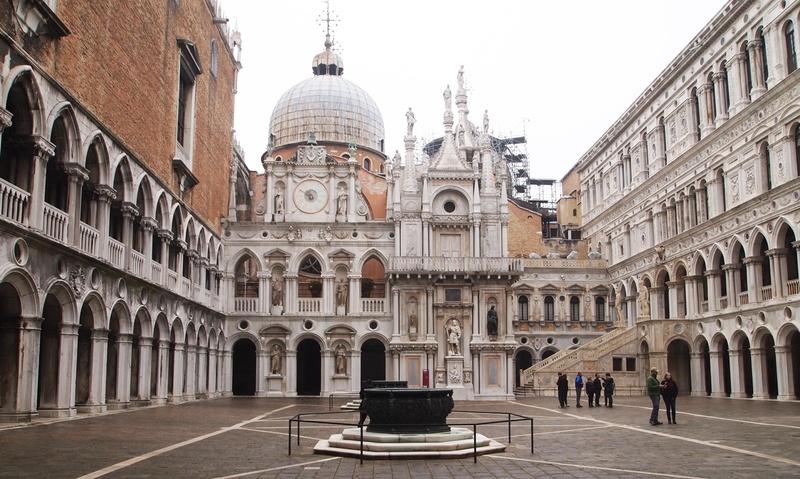 Just next to St. Mark’s Basilica is the Doge’s Palace and the ocean. 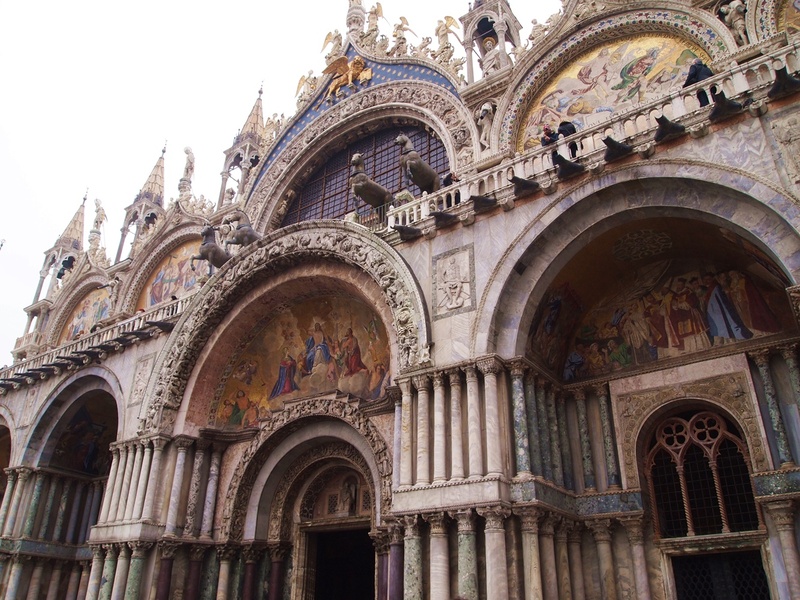 We stopped by St. Mark’s Basilica – a must-see for anyone in the area. 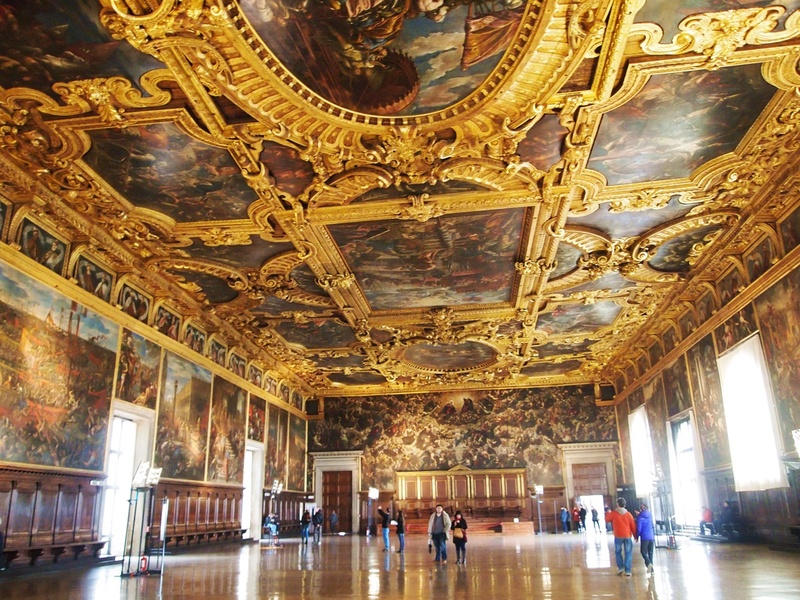 The inside is decorated almost entirely by gold mosaic tiles that glitter when light passes over them. 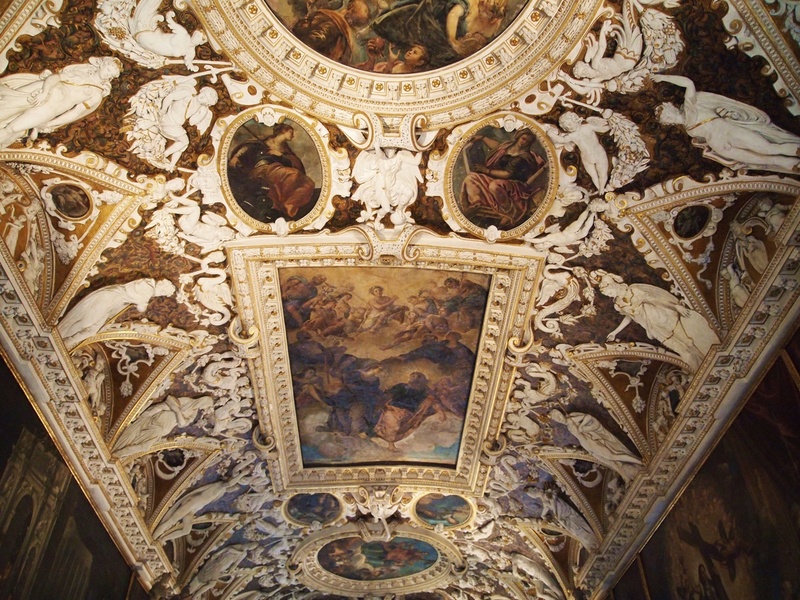 In some spots, the ceiling reaches over 140 feet – and the detail in the decoration, even that high up, is stunning. I was blown away by the detail in every ceiling. Looks like I wasn’t the only one, either. The scenes usually depicted stories from the Christian or Grecco-Roman traditions. 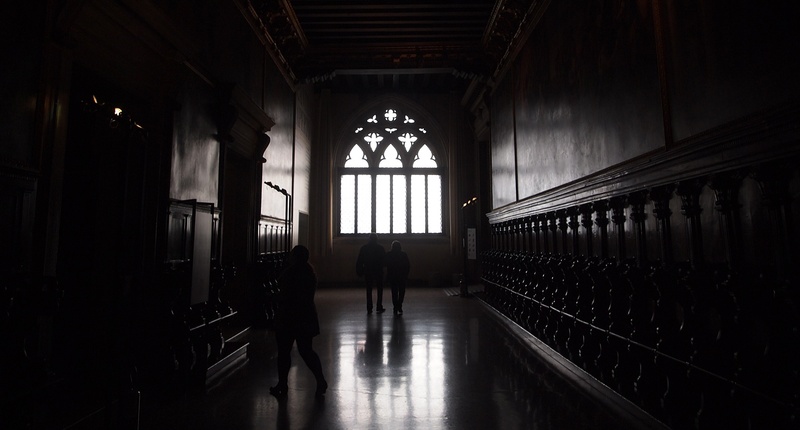 Light shining through the corridors. This was the main senate meeting room, where the Great Council would discuss political issues. Personally, I thought it looked like a good spot for SU’s next ballroom dance event. 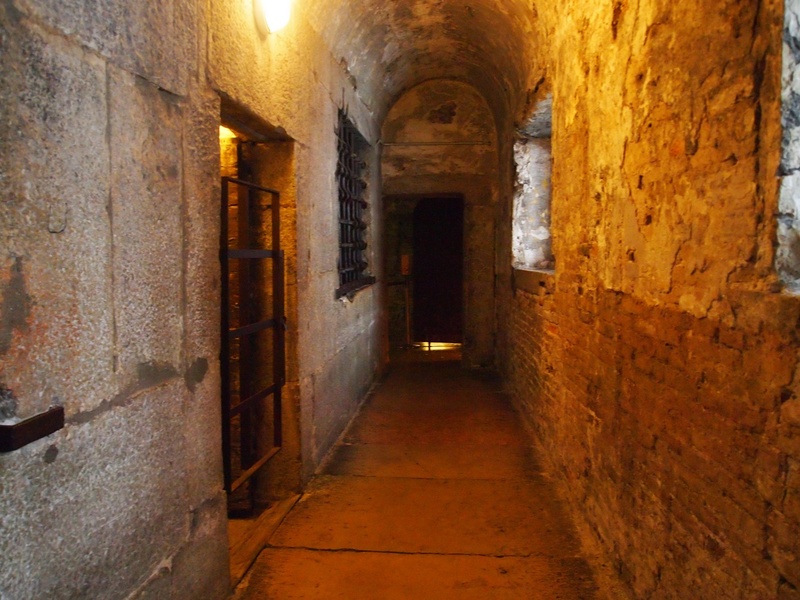 We even got to explore the palace’s prisons. Wouldn’t want to end up in there, that’s for sure. Afterwards, we grabbed a quick snack from a nearby market and met up with our friends who had been on a field trip for some more good ol’ fashioned exploring. 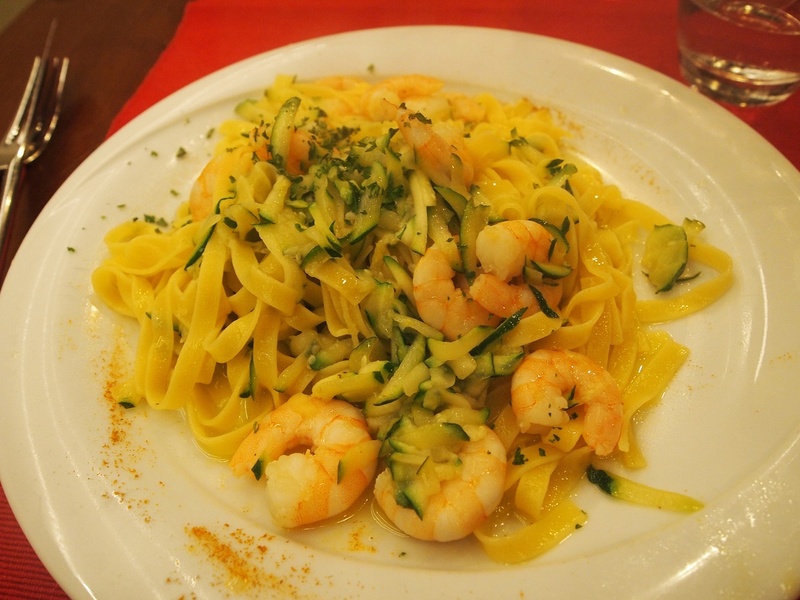 We worked up quite the appetite and found a trattoria near our accommodation for some dinner. My host dad suggested I try the “spaghetti alle vongole,” or, spaghetti with clams, so that I did. Best seafood/pasta combination I’d ever had. The city lights start to sparkle as the sun goes down. 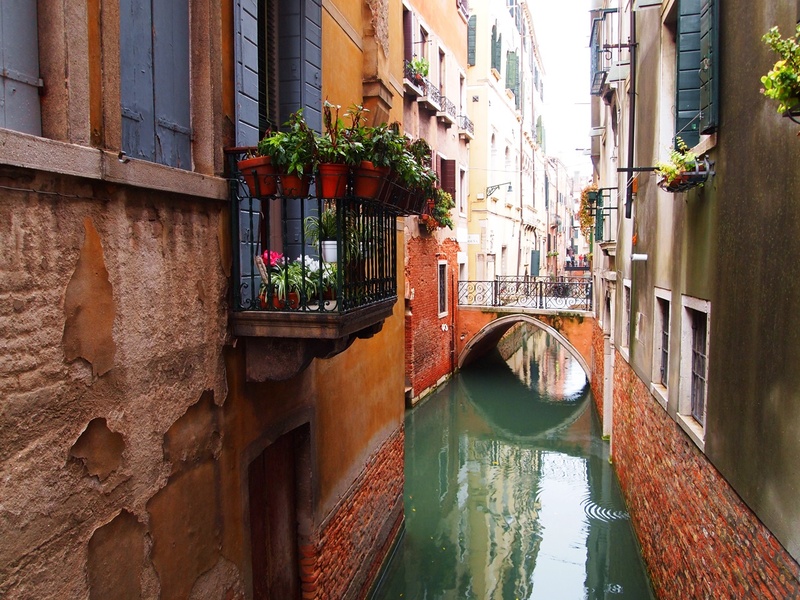 There was a beautiful surprise around every corner in Venice. Bridges like this one connected the neighborhoods on either side of the canals. 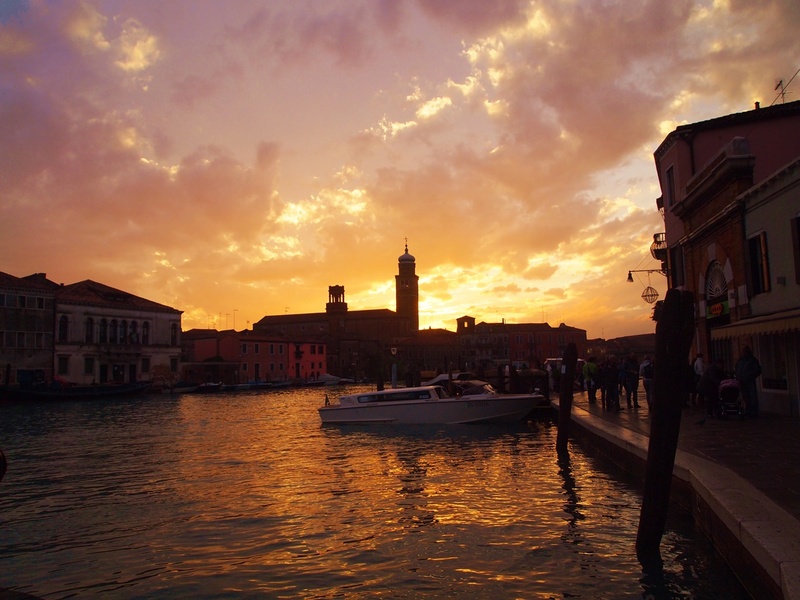 We had three items on the agenda for the next day: explore, ride a gondola and visit the island of Murano. 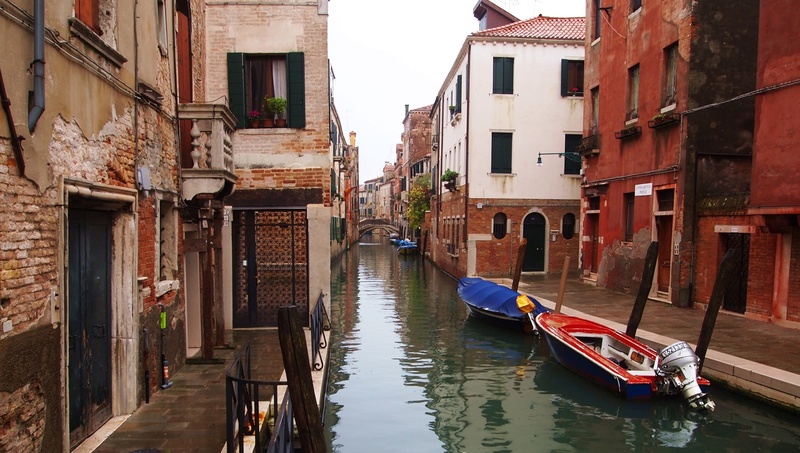 We ventured through and past the tourist areas into the real Venetian’s Venice. 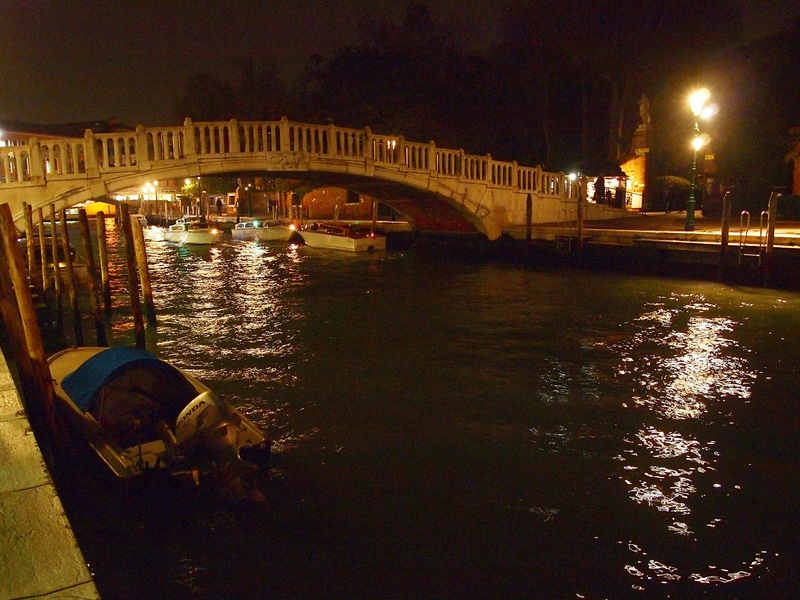 And it was just as beautiful as the Venice you see on the postcards. Looks like someone’s on their morning commute. Looks like the water can rise pretty high in flood times. We had some rain during our visit, but luckily not too much. 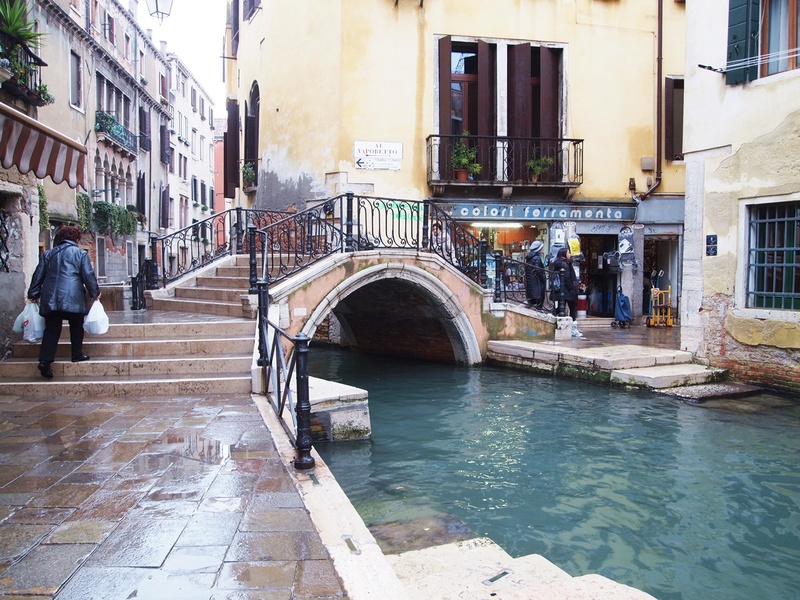 When we made our way back to the main areas, we did some shopping and ate a quick lunch at a panini shop. 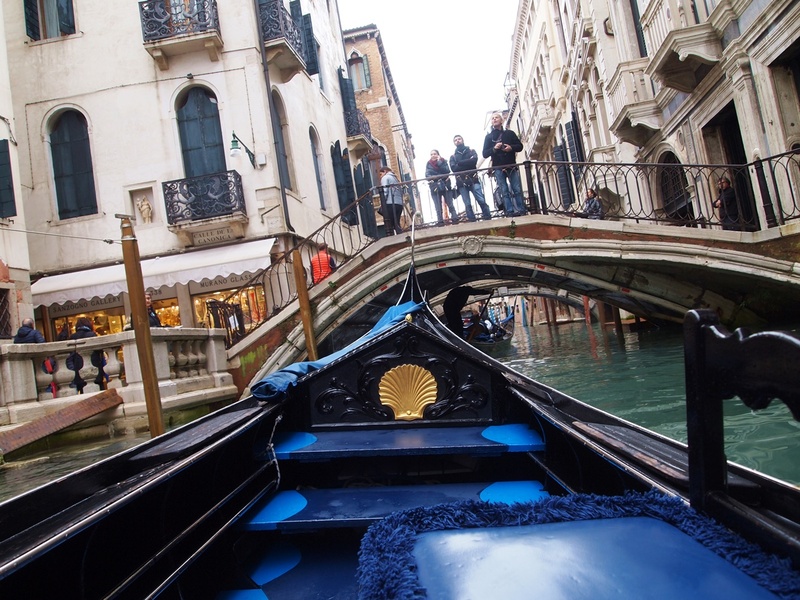 Then came the experience on everyone’s bucket list – the gondola ride. 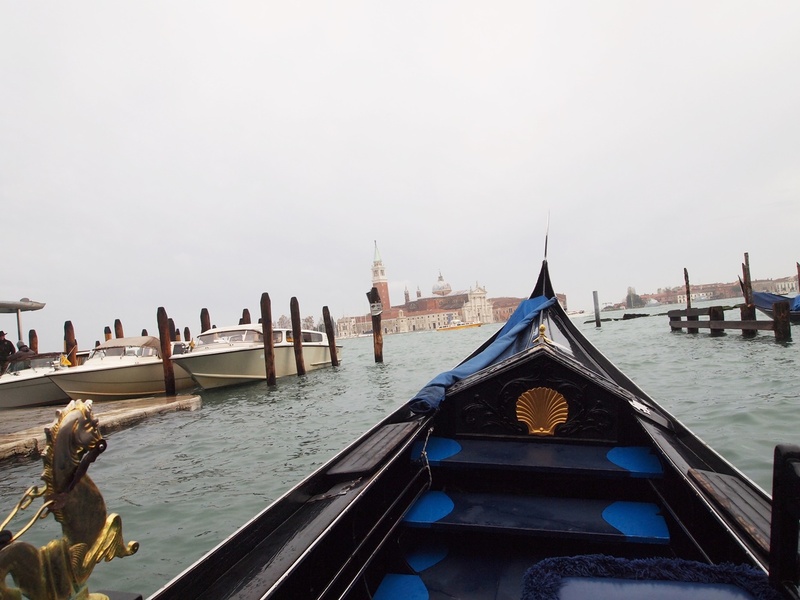 We hopped on the gondola near the edge of the main canal, but our driver took us into the smaller canals, too. This little guy kept us company. 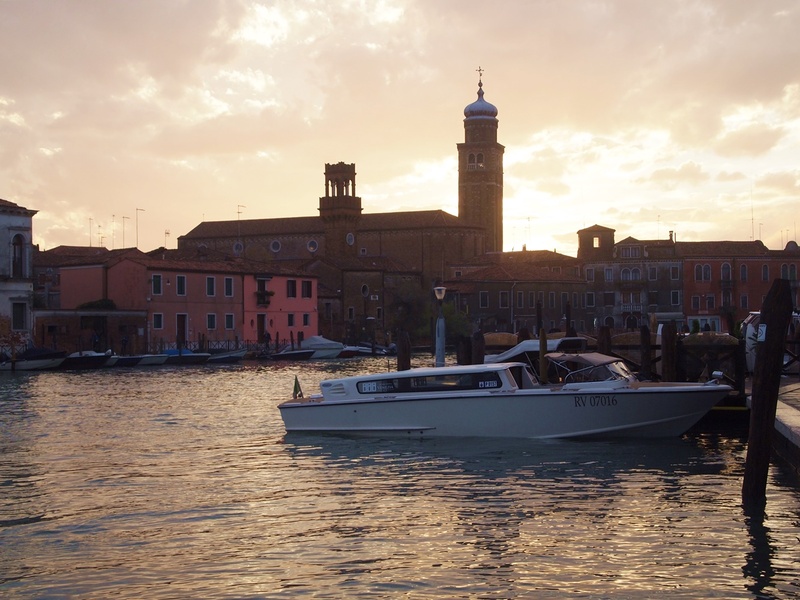 It’s one thing to see Venice by foot – and another to see it by boat. Back to the start! The trip lasted about 45 minutes total. 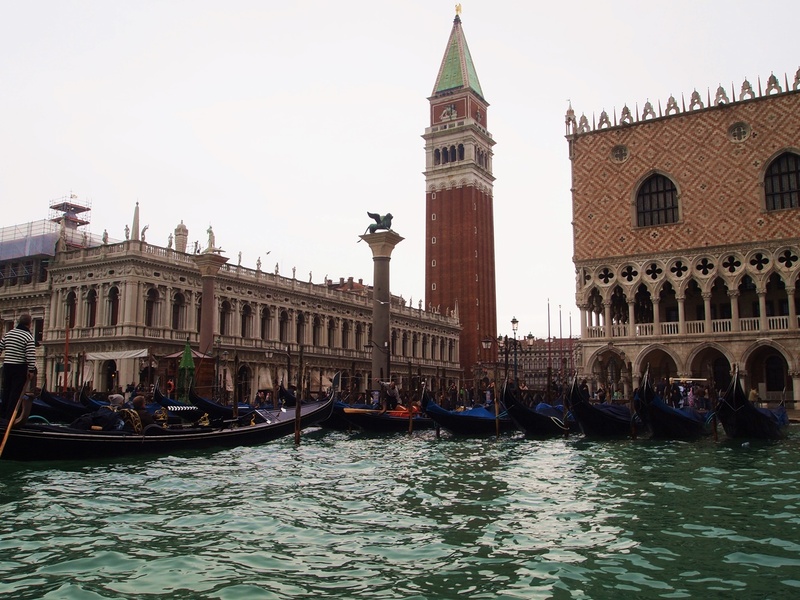 There’s the Doge’s Palace, as seen from the water. We were in the one on the right. 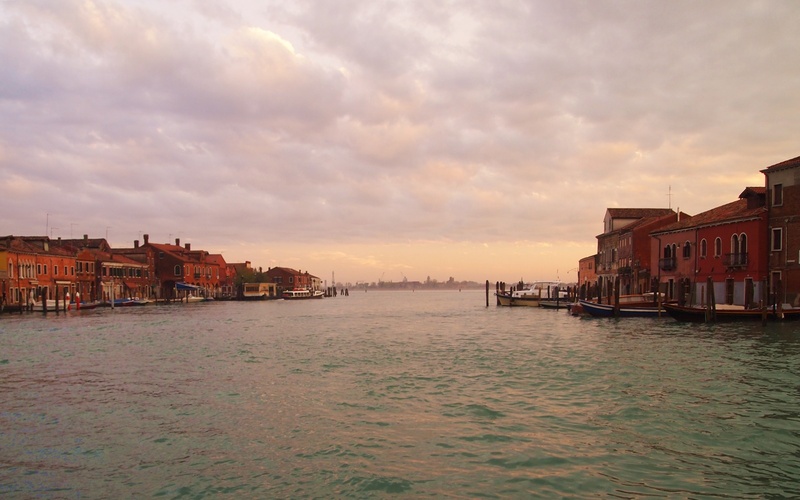 Next, we walked across the city to catch the water bus – yes, that’s a thing – that would take us to Murano Island. 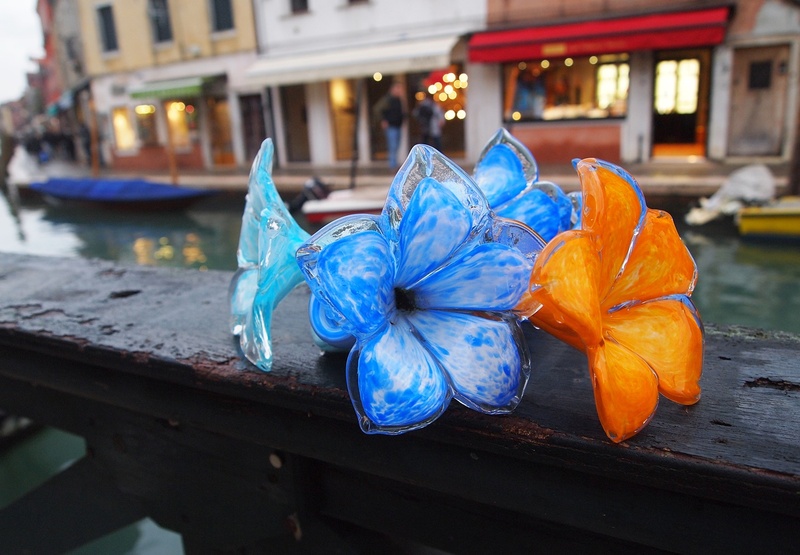 Murano is just under a mile away from the mainland Venice, and is world renowned for its glass artisans. 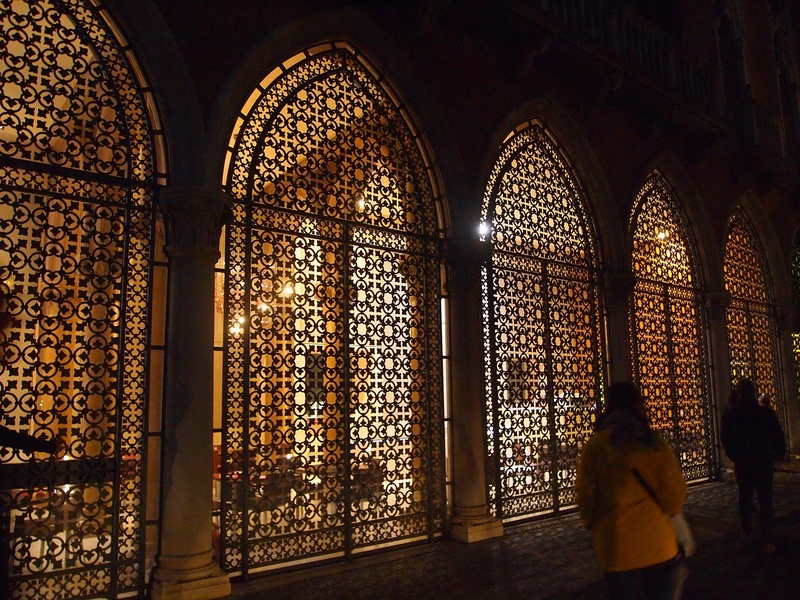 In the middle ages, glass was a sought-after, prized luxury, and Venice was beginning to build a reputation for having the best glass artists in the world. 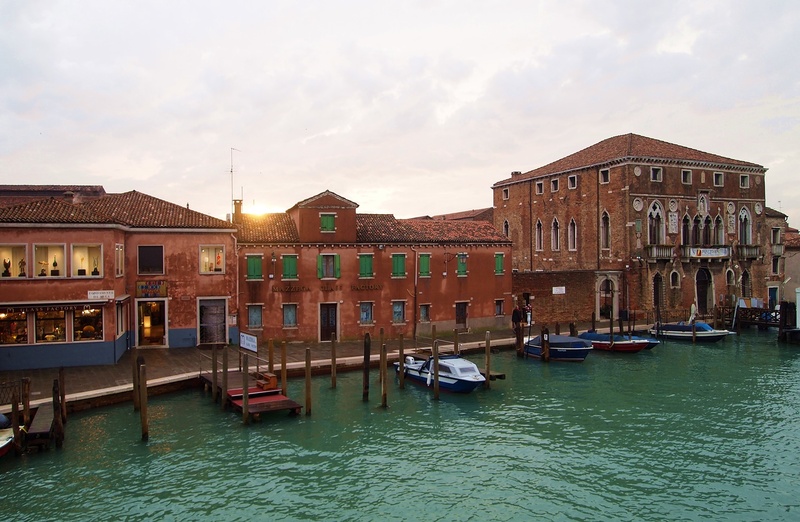 However, after a few scarring fires on Venice’s mainland, the government decided to move the artists to the island of Murano so that their equipment would no longer endanger the rest of the city. 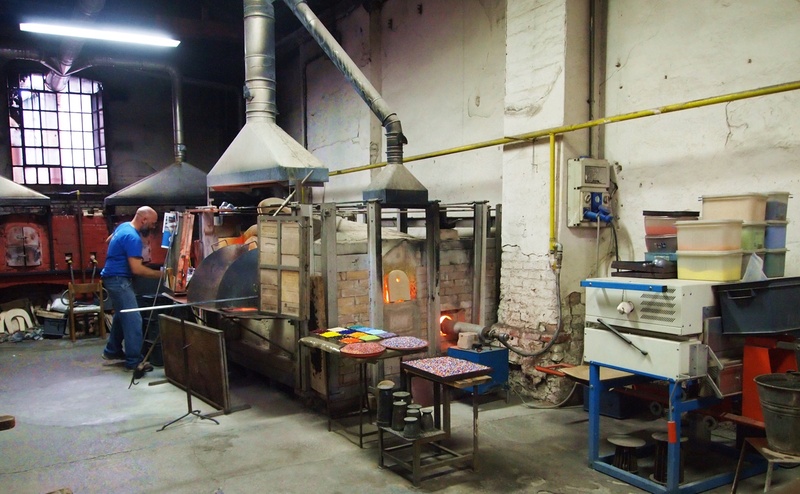 We stumbled upon the open studio of an artist, who gave demonstrations on how glass is made. 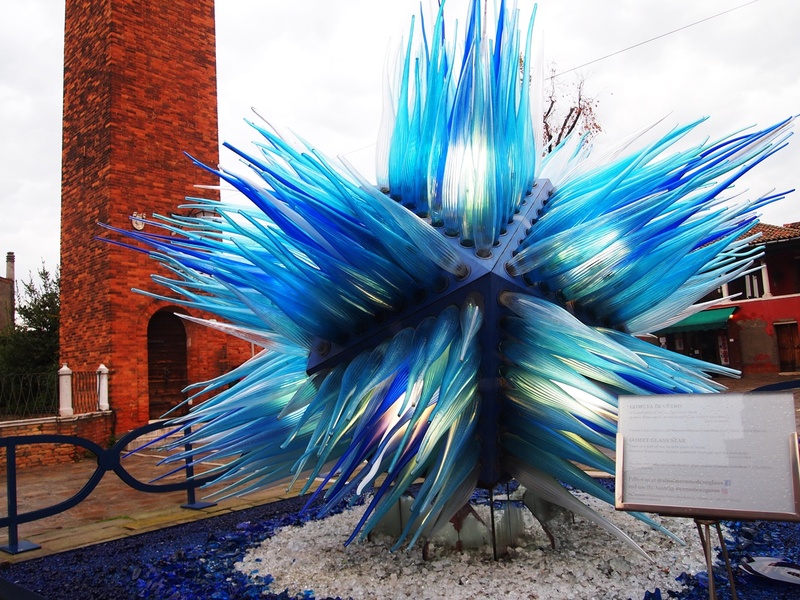 Glass art, both indoors and outdoors, was scattered everywhere on the island. We stopped by the gallery of Simone Cenedese, one of the island’s most famous artists, and later bumped into one of his outdoor installations. We spent some time poking in and out of the shops on the island, admiring the work of the artists along the way. As we began to head back to the mainland, the sun started to peek out from the clouds. Looked like the beginning of a beautiful sunset. After taking a few more steps toward the water bus stop, we turned around once more and saw this. All the way back, we watched the sun sink into the water from the water bus. By the time we got back to the city center, it was dark out. We stopped by a nearby trattoria for some dinner. I kept with the weekend’s seafood theme – and I was so glad I did! The coolest part? Hearing Vivaldi’s pieces in the very church they were written for. Vivaldi wrote his music for the orchestra of orphans he taught and conducted – and their performances were held in the church we were sitting in. 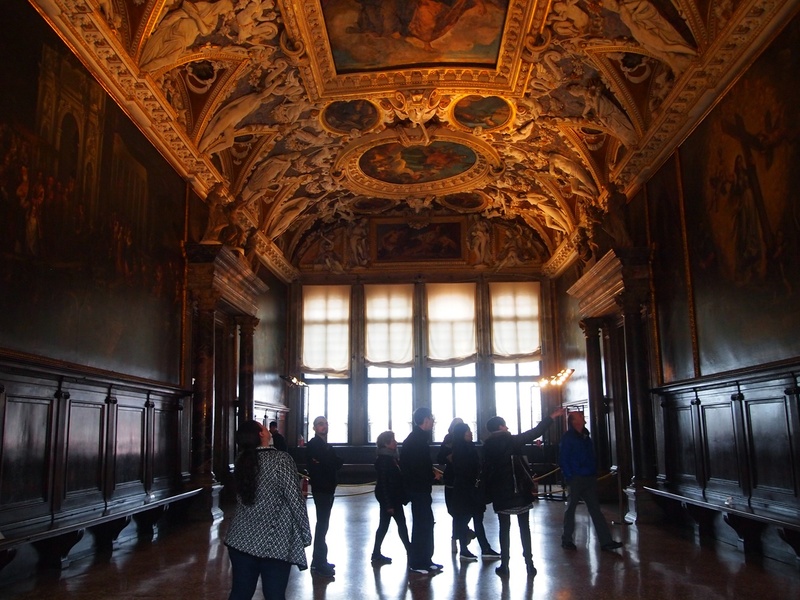 The concert was wonderful – the perfect end to the perfect visit to Venice.